The discovery of the invasive emerald ash borer in Sauk Centre has put all of the town’s ash trees at risk. To prevent the spread of the infestation, the Minnesota Department of Agriculture has put Stearns County under quarantine and strictly limited the transportation of wood products, while the city will be cutting down and burning trees as quickly as possible before the insects’ active season in May. EAB, native to northeastern Asia, is an invasive species of insect that has killed hundreds of millions of ash trees in North America since its 2002 discovery near Detroit, Mich. EAB kills ash trees by laying their eggs under the bark of the tree; when the larvae hatch, they eat their way through the tree, cracking the bark and cutting off the tree’s water passages. EAB only affect ash trees, and any one big enough for the insect to bore a hole inside could be infected. EAB has spread to 35 states and five eastern Canadian provinces. It first arrived in Minnesota in 2009 and was detected in Clearwater by September 2018. With over one billion ash trees, Minnesota has more than any other state. 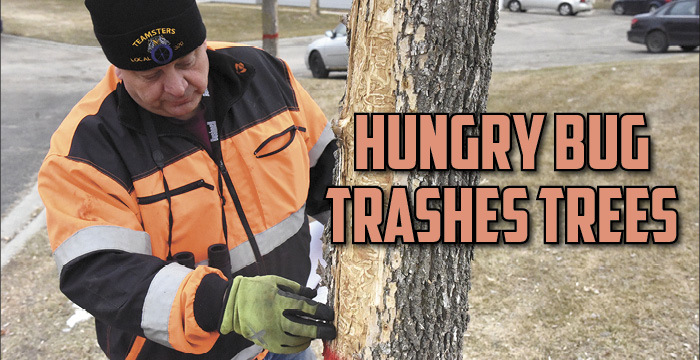 City workers Bill Berg and Andrew Rousslange were performing their regular tree inspection in the southeastern area of Sauk Centre when they noticed the signs of an infestation. Symptoms of EAB include a decline or complete lack of leaves, light-colored bark that is cracking or peeling and the larvae’s characteristic S-shaped galleries in the tree’s wood. Woodpecker holes are also common in infected trees as the birds feed on the larvae. When the insects mature, the adults leave D-shaped exit holes in the bark. It is unlikely that the harsh winter had much of an effect on the EAB population. While most EAB larvae die at 30 degrees below zero, they were also insulated and protected from wind chill by layers of bark and snow. “There may have been some winter kill of the less hardy larvae, but probably not enough that we’re going to see a huge impact,” said Katie Winslow, University of Minnesota extension educator of horticulture, small farms and local foods for Stearns, Benton and Morrison counties. After EAB was discovered in Sauk Centre, the MDA placed Stearns County under quarantine to prevent further infestation. Firewood, defined as any wood shorter than 4 feet in length, cannot be moved and must be burned where it is chopped. Wood chips and any type of wood product must first be inspected by the MDA before it can be transported; anyone moving wood without a certificate from the MDA is liable for a fine of up to $15,000. As Sauk Centre is close to the border of Douglas, Pope and Todd counties, it is especially important for the quarantine to be maintained in town. In Sauk Centre, the zone of greatest infestation is the four-block area between Highway 71 and the Stearns County Fairgrounds. In that area, 132 ash trees are at risk, not to mention the number of other trees within the EAB’s half-mile flight radius. To prevent the spread of EAB in Sauk Centre, the city is marking infected ash trees with a painted red ring and cutting down the ones they can manage. They can only cut the trees in April; from May 1 through Sept. 30, the insects will be active and cutting down the trees would only spread the infestation. Because of the time crunch, the city is removing trees at no expense to property owners, who are being notified by postcard if one or more of their trees is infected. Property owners will also be notified if their infected trees cannot be cut down by the city. “There’s the potential that, even though we’re willing to help the homeowners take their trees down, that that may need to hire a professional contractor to take that tree down due to proximity to their house or other structures,” said Ben Clink, director of Sauk Centre Public Works. For non-infected trees, there are treatment options such as trunk pesticide injections every two years or soil and bark injections every one to two years. After the trees are cut, they will be taken to the lot south of the Public Works building. Bigger logs will be burned, while smaller wood will be chipped. Tree removal could have a high price for the town, both to the city and to property owners who need to hire a tree service. Cutting down a single tree is estimated to cost around $500. Ash trees thrive in naturally wet areas, so planting new trees will be important to prevent soil erosion. Planting new ash saplings will be out of the question until the infestation has disappeared, and the incoming trees will likely be a diverse assortment to prevent a similar wide-ranging infestation in the future. If you suspect that your ash tree has EAB, contact the MDA’s Arrest the Pest line at 1-888-545-6684 or arrest.the.pest@state.mn.us. More information can also be obtained at Sauk Centre City Hall.